Think you're too cool for school? Think that you don't need to play though an entire season to show your worth on the court? For those people, you're in luck with the PLAYOFFS mode. You can skip the regular season and head straight to the postseason. Do you have what it takes, tough guy? 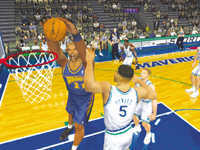 In recent years, sports games have branched out into other areas outside of the simple gameplay dynamics. Today, gamers can establish their own teams, and manage them, just as a real NBA general manager does. NBA 2k2's FRANCHISE mode puts the powers of a GM at your fingertips. When you choose your team, you'll be in complete control of the roster, which means dealing with salary caps, free agency, trade offers, and contract demands. During the real sports seasons, many sports fans enjoy following the season by participating and creating a fantasy team comprised of their favorite players from teams throughout the league. Based on how well each player does during the game, points are awarded, and a winner is chosen. NBA 2k2 allows you to do that in the FANTASY mode. All of the NBA players are placed in a giant free agent pool for you to draft from and construct your ultimate fantasy team. Once your team is ready, you can choose to participate in a tournament mode or play a full season. I'm not much of a sports simulation gamer, but the game's fantasy mode did catch my attention, and I thought it was pretty cool building a "what-if" team. If you were a fan of the outdoor courts from NBA 2k1, you'll be pleased to know that Visual Concepts received a lot of positive feedback from this feature and decided to include it in this release, with a few new additional digital representations of existing real-life basketball courts. Welcome to the STREET COURTS mode! If you want to escape the sounds of a noisy stadium and the running commentary, the outdoor courts are where you'll want to be. You can actually hear ambient city noises in the background, as well as the players talking trash to each other. You can choose to play a simple game of 2-on-2, or can have a regular game of 5-on-5. The outdoor courts you can choose from are Rucker Park, The Cage, and Goat Park in New York City, Chicago's Franklin Park, or Mosswood Park in Oakland California. One of NBA 2k2's biggest draws is something that no other basketball game has - online gameplay. With the NETWORK mode, you can go online and show the world just how hot you are. If you do plan on going online with NBA 2k2 keep in mind that it might be convenient to have a Dreamcast keyboard handy, when setting up a game. It makes communication much easier. I'm not sure if Sega's hard-to-find broadband adapter is compatible with NBA 2k2, but it is fortunate that Visual Concepts provided Dreamcast modem users with filter options in the network settings so that we can filter out the games with the poor bandwidth. So that only the best and fastest games are available. It is also possible to set filters for players with or without keyboards, and filters for game modes for official games, or "unregistered" games, which probably means user-created teams, with super-human created players. Even a good game isn't perfect. I was a little disappointed that NBA 2k2 did not really build upon one of my favorite features from NBA 2k1, the create-a-player mode. With all of the custom player faces, even the realistic texture mapping of specific player's tattoos, I was surprised that none of these were included as options to be used on custom-created players. I know that it's a small feature of the game, but it was something that I was really hoping that they would have improved upon. My next issue is a little more serious. Some of you online Dreamcast gamers may not be aware that as of November 1st, Sega will be charging $9.95 a month to play their games online, something that I strongly, strongly disagree with. One of my biggest criticisms in my review of Phantasy Star Online Version 2 was that the game featured some new gameplay features, but you had to shell out some green to access them, and they were only available online. What does this mean for you the gamer who may be interested in purchasing NBA 2k2? It means that games that you once enjoyed for free will only be accessible after you give Sega a credit card number. This wouldn't have been such a heated problem with me, if there were more games coming out for the Dreamcast that were online compatible. 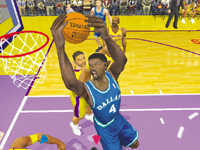 This is not the case, as NBA 2k2 is one of the Dreamcast's final few online games. I think it is an insult for Sega to charge for online gameplay, because it's obvious that the only people supporting the Dreamcast now are the loyal fans, who have been put though utter hell with Sega's new transition. After Shenmue II's cancellation, Sega charging their loyal fan base a monthly fee to play games on a dead system, especially after they failed with their Internet Service Provider, SegaNet, is insulting and unwarranted, and I do not appreciate it in the least. Fortunately, NBA 2k2 is still multiplayer without the use of an online connection. Visual Concepts is truly a great friend to Sega and the Dreamcast. While other developers were jumping ship, and porting their games to other next generation consoles, VC stood its ground with the Dreamcast and showed its loyalty. It was there when the Dreamcast was launched, and it is here now as the Dreamcast dies. Sega Sports NBA 2k2 is a very strong title, and one that any Dreamcast owner should be proud to own. If a game by Visual Concepts can look this good on an "inferior" system like the Dreamcast, I'm willing to bet that VC's products on the more "powerful" next-generation consoles will be utterly jaw-dropping and breathtaking. Thank you, Visual Concepts for supporting the Dreamcast even in these tough times, and for providing us loyal gamers with some great titles to remember the system by. Highs: Great gameplay, improved animations, better collision detection, fantastic low-post game. Lows: Payment required to play online. Bad move, Sega! Very bad!